Process: As always I used Google image research to look for a matchable image. 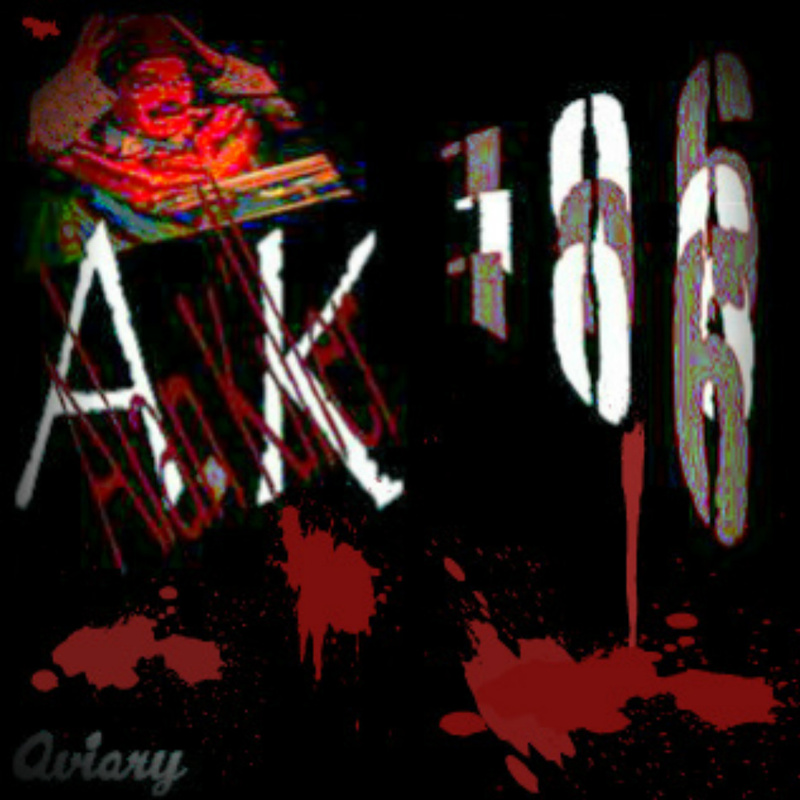 My next step was how to combined Alan Kay and the number 106 making it look horror. For this work I mainly used Aviary, and FotoFlexer . It was my first time to use FotoFlexer which I founded by typing image editing in Google. It was similar to Aviary in a way that you do not need to download it’s not too complicated to use it. This program have amazing tools, colors and effects so I recommend people to use it. Especially, people that are stuck with other edit programs. With Aviary I added the letters and numbers using a font that will give an horror impression. After playing with it for about 20 minutes I ended up having a pretty scary image. After I started to look for new programs and I found FotoFlexer. I just downloaded the image that I had already and start to try some amazing tools that they have. I used ink splotches because I thought it will give more horror to my image. Story: First of all, I just want to mention that I have nothing against Alan Kay hahaha. I am mentioning this because of the phrase mention in the image “Alan Killer”. Well I wanted to make a horror image, and using the initials of the Pioneer, I realized the K for Kay will give a scary image if a transform it into Killer. Now, I will give a story of the original picture. I went back to Google images and find this picture. 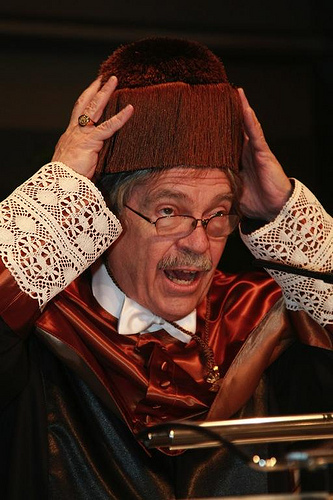 Then I clicked to take me to the page where it was originally.On 28 January 2010, Alan Kay was awarded honorary doctorates by the University of Murcia for his contributions to the development of the personal computer and object-oriented programming. In the ceremony he wore the clothing above and present a speech which I found a Youtube video of it posted below. Sorry I couldn’t find an English version, however from 3:58, show the speech of Alan Kay although it last only few minutes. in the last 10 years, Alan Kay has received many awards and recognitions such as the one in Murcia University, or one in 2009 from Kyoto University. Using the Way Back Time Machine website on Internet Archive, take screen shots of a favorite website overtime. Then, look at how the website has changed for better and worse. Blog about what makes a website effective and how that changes. Process: First of all I did a google research on Way Back Time Machine website as I never heard of it. I got really surprise after founding out what this service is all about. Basically, this website is an Internet archive where allows users to access to web pages of the past. Amazing right? I just didn’t imagine of such website existences. My next step was to search for a website that impacts my readers and myself. I started with Facebook but unfortunately, they did not have the record for Facebook which I found really weird and got disappointed as it is one of the most popular websites on the Net. I look for Youtube, Google, Wikipedia, Yahoo! and other services and actually was pretty fun looking at how these websites have developed through the time. However, non of these websites impressed me a lot. There I was lost thinking of a known website that can be attractive and that can had a radical change. 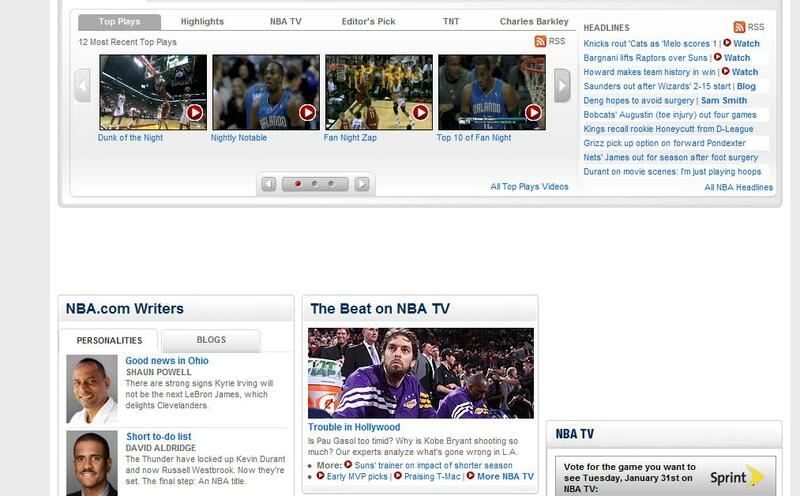 I was at the computer lab sitting with my boyfriend, and he was looking at the NBA website. 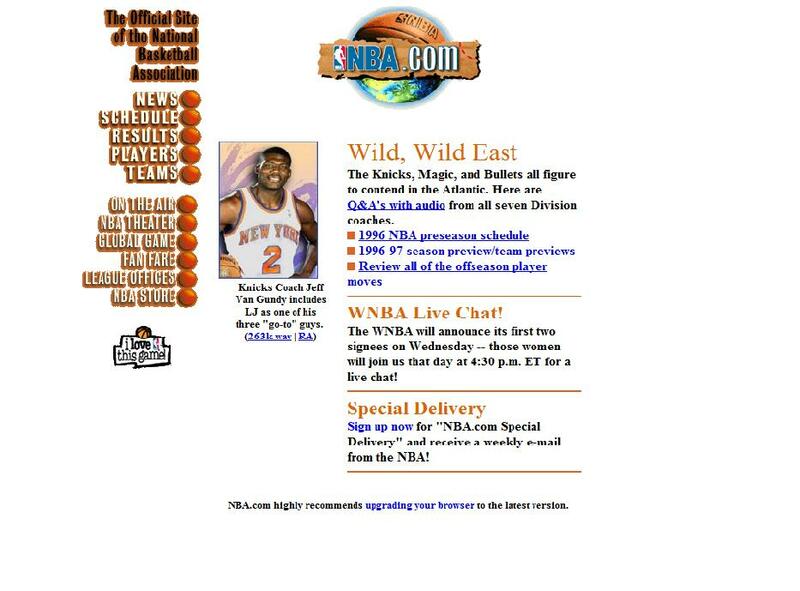 He got interested in my work, so I looked up at the NBA website on 1996 and it was just shocking. He was surprise as much as I was when we saw the differences. Instantly, I knew that this was the perfect website to use. 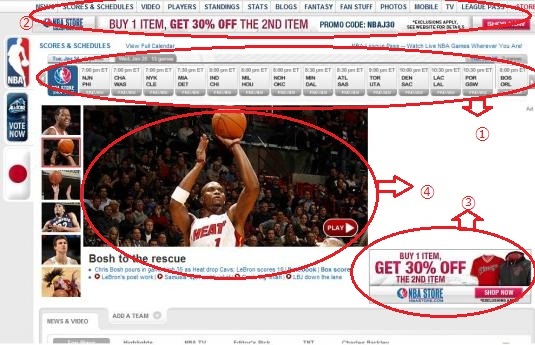 Simply I looked at the recent website of NBA and took screen shot same as for the old one. Here I learned a new thing about the computer. I do not know if its embarrassing or not about not knowing the existence of the ScreenShot. Well, I did not know and the first thing that came to my mind was taking picture of the screen with my camera (Yeah thinking it now, it is really embarrasing). When I knew the existence of that button told by my boyfriend I was embarrassed and realized that there is so many stuffs that I do not know of the computer and if I knew it before, my life using the computer will be way more easier. After, taking screen shot, I use Gimp to modify each image. Story: Here I am going to blog about how the website improved during 16 years. According to Way Back Time Machine this website is a record of the October 22nd 1996. As everyone can see it is very simple, but what surprise me about is that it has actually colors and a image like the one on the top of the website. When I was looking at past websites like Google and Wikipedia, they did not have any color or image at all, just letters. Also, it impressed me that this website have the category of buy online and live on the Internet. It was not too simply like the others websites on 1996. In my opinion it is quite a pretty well organized website for at that time. Now, lets have a look at the recent website. ①It shows how many games are going to play and the time schedule of it of that day, the day before and the day after. 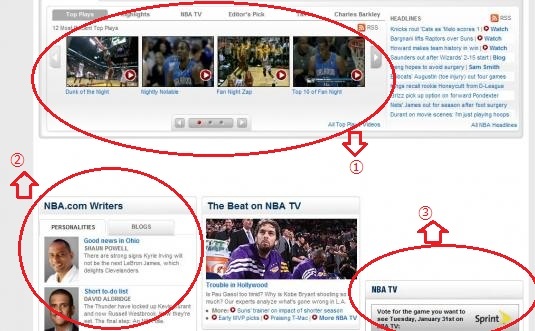 ② The top of the website provides lots of categories where a user not only enjoy looking at the news but also reading blogs, watch videos or get informaion about the players. At the end of the website, not only votes, galleries are avaiable but also, access to NBA with other services such as Twitter and Facebook are shown to follow. Some informations provided here you can find it at the top of the website as well as at the center. I imagine that the purpose of this, is to give access to mainly information at anywhere of the website the user is on. Another difference with the old website is that, here you can see that each category is divided with a frame which make the users easy to read. Also, as the recent website has more variety. The old one contains information such as news, schedule, results as well, however the recent one made it easier for the readers to have a look at the main information in the top page without having to wait for page to open. One can enjoy exploring at the website with the new one and enjoying it better. This shows how the technology has advanced and how throughout the time, websites became easier to use. Create an iconic image/design for your own site that somehow represents you. I was not sure if I am allow to do this, but instead of creating an iconic image for myself, I created a image of Alan Turing. My first task was to gain more knowledge of Alan Turing. I started my research by looking at the comments on Turing Centennial by Professor Lockman. I decided to use the Alan Turing Home Page as I founded well organized and detailed information about Turing. After reading at his short biography, I decided to pick up the main events of Turing’s life and find an image that symbolize each event. Google image helped me with this task where I spend quite a fun time exploring many pictures and choosing a matchable image. Here it comes the hard part of this assignment, playing with the editing programs. I am surprise of how I became bad at using them. Maybe around at the age of 10 or 13, I used to edit pictures with friends putting texts, change colors and effects on the pictures. Anyway, I opened up Picnik however, when I tried to register I was like “NOOOOO!” unfortunately, the website is going to be closed of April 19th, so people are not able to register anymore. Then, I tried with Gimp, where I got stuck. I do not know if its because I am using it on OS X or what, but I could not figure out how to use it. After one of the longest 30 minutes of my life past, I decided to go for another program. Aviary was my next challenge. Fortunately, this program was not as hard as the other ones. It was easy to register, easy to use and the design of the website is really cute, I personally loved it! With Aviary, I first change each picture into white and black because I think its a classic effect. The next step was how to put them together. Well, I did not want to make it so complicated, so basically I just put them on chronological order. After I added a little bit of shadows and that’s it. After I felt annoyed because I could not understand how to use Gimp, so I opened up again the program and tried to figured out how to use it. I ended up gaining some knowledge of it and adding a background to this image. 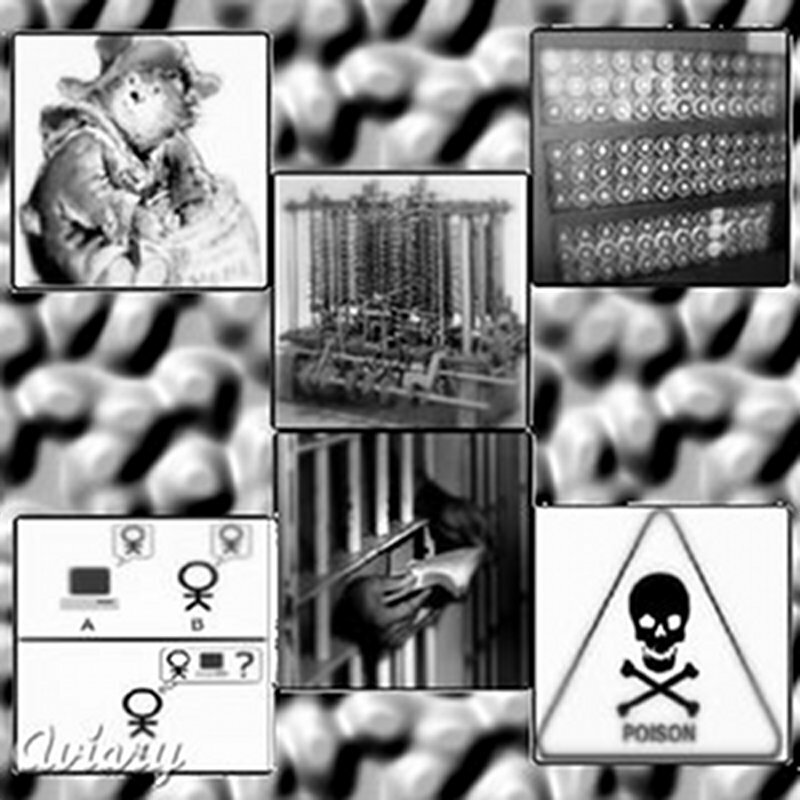 I am going to explain briefly each story of the images based on the Alan Turing Home Page. Making it very simple, the Turing Machine consist of a tape of infinite length and a read/write head which can move left and right across the tape. I spend looking at other websites which explains the Turing Machine, but “OMG” how complicated to explain it is! I was really impacted by how Alan Turing figured out all of that and created the machine. Apparently the Bombe created in 1939 by Alan Turing was used during World Word II by the British to destroy the German Enigma enciphering machine. It seems that not only Turing invented one of the best creations but also, with his creation of bombe, Turing gave a great contribution toAllied victory. “Can Machine Thinks?” was Turing’s question when he introduce the Turing Test in 1950.Basically the test was suggested by Turing to check the intelligence of the machine. The test consist of a human being and a machine in a room and a judge in another room. Simply, the judge have to point out what answer belongs to the machine and what answer belongs to the human being.Turing’s thesis is that if both players were smart enough, the judge could not tell who was the human being and who the machine. No machine still can pass this exam in an experience with the scientific method. Alan Turing’s crisis started on 1952 where he got arrested for having a relationship with a Manchester man. I was impressed by reading that he did not denied the fact that he was homosexual, besides he saw no wrong on being one. I was really surprised at the fact that he was given the option of going to prison or undergoing hormone treatment to reduce libido. Turing chose injections of estrogen, which lasted one year and cause him physical alterations, such as the appearance of breasts or a significant weight gain, and also made ​​him impotent. This las picture symbolize his death. He was found on June 8th 1954 dead. Apparently, he died the day before of cyanide poisoning. Although his death was consider to be a suicide, his death has led to several hypotheses including murder. I just found an article on BBC news PM apology after Turing petition where the UK Prime Minister Gordon Brown in 2009 issued a statement declaring his apologies on behalf of the government for their treatment on Alan Turing. I was really surprised at the fact that after about 50 years Alan Turing got an apology and his actions were admitted not to be wrong at all. Having read about Alan Turing not only made me realize how technology advanced but also, how the society and the way people behave have changed too. 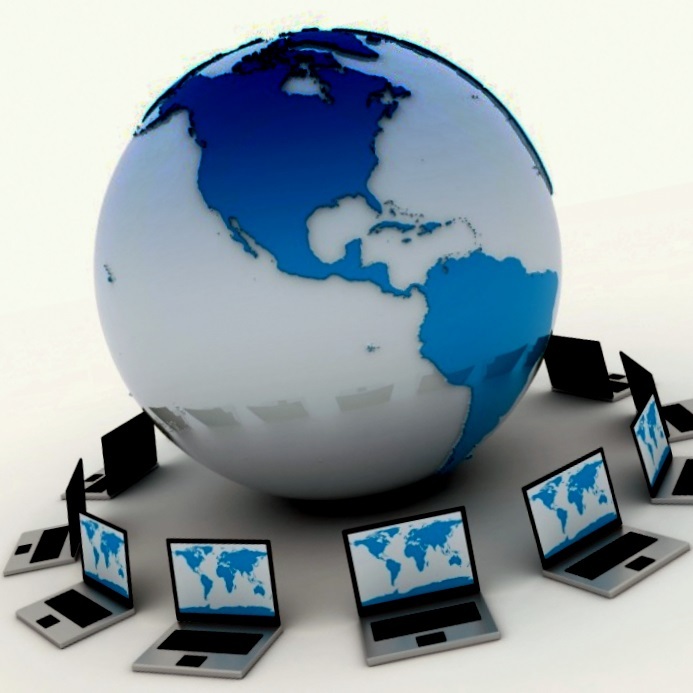 I Google it as “global internet” and found the picture above in the images. I chose it because it shows the connection between the world and the Internet. I changed the picture a little bit by using Picasa 3. To give an image of the world moving round I flipped the picture to the left and I also put a little bit of shadows. Hope to get better on using this kind of programs and create more awesome stuffs!!! My first blog. First of all I would like to say hello and welcome everyone to my blog. It is my first time to actually write a real blog, a blog that many people from different countries have access to it and can share opinions, experiences, stories and more. I will give a quick introduction about myself. Well, I am a student at Temple University Japan Campus, and I chose to take CIS 0835, a class that sure will be a great experience and opportunity to share my opinions, to improve my creativity and explore other student’s work. Anyway, I was raised in an environment with technology around me. I remember started playing games on the computer at the year of 7. Later on, I use the Internet for chatting with friends on messenger, and then use it to do research and now I use it as a social networking, studies and as gaining daily information through news. I really cannot image my life without Internet, how inconvenient will be without it. The Internet allows me to communicate with my family and friends far away. I forgot to mentioned it but I am half Peruvian and half Japanese so, services such as Facebook, Messenger and Skype are helping me to be in touch with my family and friends in Peru and other countries in the world. It is also keeping me updated with the latest events and news around the world. Listing all the benefits of the Internet will be a hard work, so I will stop here and end this first post by saying that there is lots of stuffs going on the Internet and I hope by the end of this semester to able to have a deep knowledge of what is really the Internet and its advantage and disadvantage. I had a look at some student’s blog and for sure, there is so many students with great creativity, so I am sure I will learn from people and hope that people will learn from my works too.